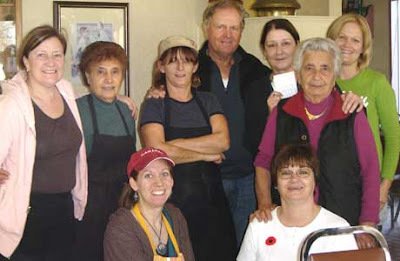 Well it wasn't quite like that but close as the Golden Bear, Jack Nicklaus passed through Southern Ontario recently and surprised a bunch of workers at a local restaurant. He even posed for a picture with the workers from Maria's Restaurant in Amherstburg. Can you believe the owner wasn't there, a huge golf fan was on vacation in Florida. Can you say large bummer. Nice one Jack hope the hunting was good North of the border.